We love fall for its iconic style, crisp air, pumpkin spice everything, and, of course, vibrant colors! When summer wraps up, and we start to feel that nip in the air, there are plenty of things wonderful waiting ahead. Whether or not this time of year still means back to school for you, fall is a great time of year for new beginnings. It’s also a fantastic way to embrace a bold new style. Don’t let the leaves be the only thing changing hues this fall. Regardless of your hair length or texture, changing up your hair color can add a whole new dimension to your look. Embrace the cozy season of plaid and apple cider with a new color palette. Whether it’s a rich, dark shade, bold non-traditional colors, or a funky new blended look, awaken your inner diva by embracing a bold new look. 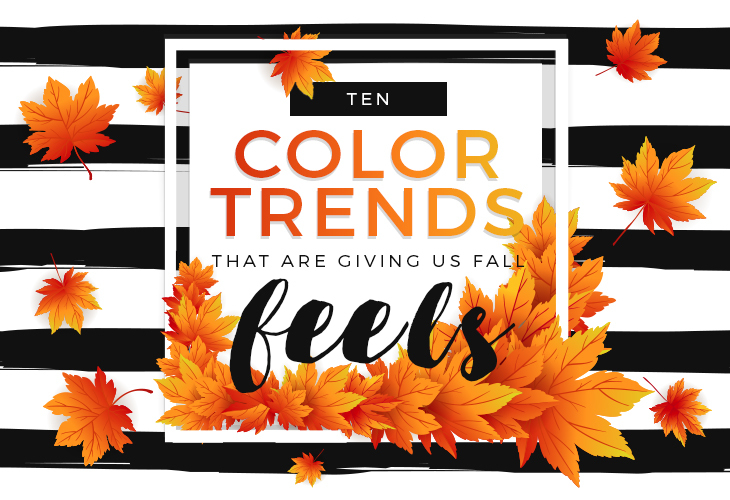 These 10 color trends will give you plenty of fall feels and a crisp, new look. Embrace the texture of tousled tresses on a blustery day with these natural-looking multi-dimensional tones, and style them with the beachy waves you perfected over the summer. If you loved the balayage looks from 2016, palm painting is the hot next generation of softer, more natural looking, two-tone styles. Hair painting is the newest method of applying highlights that is even more free-hand than the daring brushwork of balayage. Wondering how it works? Well, it’s exactly what it sounds like—the stylist uses the palm of their hand to freely apply the highlighted color to your tresses. Why is this technique so effective? The stylist literally hand paints the application to allow them to really see where the color is blending and tailor the style to what looks best on your hair and the style you are seeking. 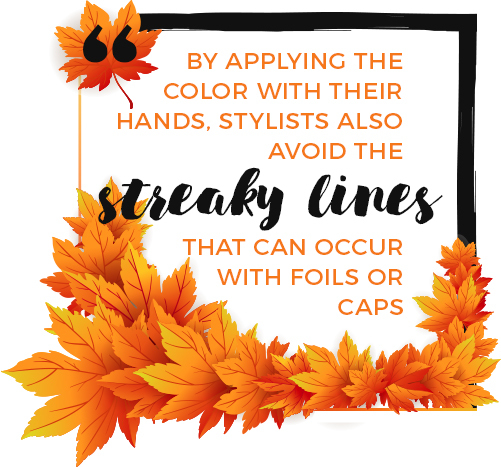 By applying the color with their hands, stylists also avoid the streaky lines that can occur with foils or caps. 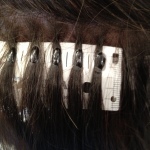 The technique allows hair professionals to blend the colors together from multiple angles, so there’s less uniformity and more depth in your strands. This relaxed, casual look is perfect for fall. Not sure how to incorporate this kind of color into your hair? Not to worry! There are plenty of ways to engage in the trend. One option is to go with an all-over color. To achieve that shocking vibrancy, be prepared to go blonde first, so the color will soak into your strands properly. If your hair is too dark to handle bleaching or you just don’t want to commit to one color, consider dramatic highlights. Want to go the extra mile and blend two hot trends together? The geode color trend may look incredibly complicated, but in the hand of a good stylist, it’s actually pretty accessable. This multidimensional look offers iridescent color that sparkles like a jewel when the light hits it. We can’t wait to see more people engaging in this trend! With chilly air all around us, anything toasty seems like a perfect fit for the fall. Think oversized scarves, post-harvest bonfires, or a toasted butternut squash panini from your favorite artisanal bakery. Update your summer blonde by darkening a couple of shades for the cooler months ahead. Perfect for transitioning lighter tresses, it helps you go a little darker without completely abandoning your golden locks. It’s also a great alternative if you want to keep the blonde and explore warmer tones over the cooler grays. So, go ahead—update your blonde hair with this darker, more golden twist on the traditional blonde. Even though we love the spooky vibes that Halloween brings every October, we’d like to stress that jet black hair isn’t just for your witch costume. With the dark and starry nights getting longer, fall has a mysterious edge with a sultry allure. Embrace your inner diva by revisiting this classic jet-black look. Allowing for a stunning contrast against fair skin, high cheek bones, and bright eyes, black provides an intensity reminiscent of the inky night sky during cooler months. The good news about this shade is that it doesn’t harm your hair the way lightening it does because the dye doesn’t contain ammonia or bleach. Quality darker hair color can make your hair even healthier because some contain conditioners and keratin that help strengthen the hair. We also love the true black look for its ability to capture and emit brilliant shine; just make sure you take proper care of it to maintain that gorgeous luster. Black hair pairs well with bold colors that have cool undertones. Love the drama of dark hair, but still too scarred from your teenage days of worshipping Emily the Strange to go back to black? Dark brown is the perfect option for people drawn to dark color, but still want to maintain a touch of soft warmth. It’s a great alternative to true black because it’s versatile and works with so many different skin tones. It’s also forgiving to a variety of bone structures. A classic color that’s low maintenance, it’s perfect for a time of year when life gets busier, whether it’s heavier work commitments, school, or you finally hunkering down to work on a new project. Still dramatic enough to be alluring, pair this beautiful color with a chunky, cream-colored knitted sweater. The stunning contrast will captive everyone who crosses your path. Nothing says fall like the intoxicating aroma of cinnamon in the air, whether it’s baking in a pie, sprinkled into cider, or stirred into a hot totty. Embrace the warmth of this time of year by incorporating this dazzling shade into your hair. Perfect for those who love the warmth of red but who don’t want to go full-on ginger, the warm red undertones add a whole new dimension to classic brown. You can blend warmer tones into your hair with highlights, but since the color is so multi-dimensional on its own, you can add depth and richness without too many complicated color application techniques. Remember your grandmother’s hair advice? Have dark hair in the colder months and light hair spring and summer? You feel it, this time of year, every year—that tiny tug of sadness as the bright colors and blondes are put away, and everything gets … well … darker. If you have darkened your mane in the past, perhaps your mood goes right along with it. Well, let this new trend give you permission to stop fighting your love of blonde and embrace light locks with this edgy twist on your favorite hair color. Just because our nail colors are getting darker this time of year, it doesn’t mean your hair has to follow. Break the mold with this latest trend that dares you to shine. In 2016, it became popular to add silvery gray to blonde locks to get a stunning icy style. Try adding some cooler undertones as well and keep your mane bright and shiny this season. You’ll bring a chilly fall edge that is perfectly in step with the season. Even though we already talked about vibrant colors, we think contemporary shades of red deserve their own mention. In the fall, there’s nothing as beautiful as when you find a tree covered with dramatic red leaves. To achieve a vibrant hair color, you’ll need a light base to work with. If you have dark hair, it will need to be lightened first before it is dyed. Also, if you have dark hair and are planning on going significantly lighter, a professional colorist will test a few strands first to make sure you can get the results you want. One thing to remember about red is that if you want it to stay vibrant (and you do—it’s absolutely gorgeous), you’ll need to touch up the color regularly and protect it from water when you can. Red hair color is very fragile, so just tie it up and keep it out of the water when it’s time to warm up in a cozy bathtub. 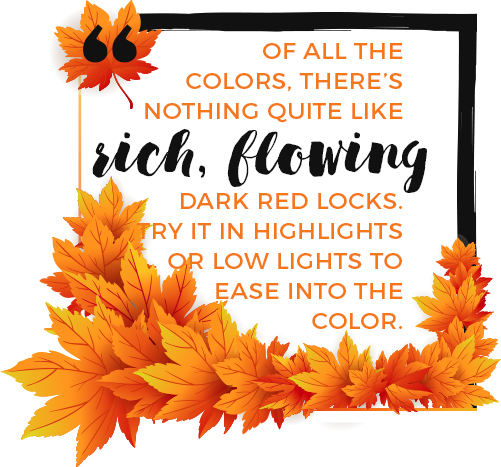 Of all the colors that give us the fall swoons, there’s nothing quite like rich, flowing dark red locks—the name even starts the same as autumn! The color falls somewhere between the bright red leaves and the crispy fallen brown ones and blends effortlessly with the natural palette of the season. If you like the idea of going red and are looking for more drama than warm brown but less intensity than a true red, auburn is the perfect way to go. Perfect for any hair length, auburn is another one of the more versatile looks in this list. It captures a brilliant shine like black and dark brown colors, but this hue offers an intriguing and unique edge. Try it in highlights or low lights to ease into the color. There are many celebrities with dark hair that have recently added stunning auburn highlights. Ombré isn’t going anywhere in 2017, and, as the trend evolves, so do your options for this dimensional look. Two tones are hot this season, and one way to incorporate them into your hair routine is to lighten your ends just a shade cooler than the roots. This look is similar to traditional ombré, but a bit more subtle. This also lets you darken your roots with warmer tones, like the chocolates, coffees, and deep caramels. You can use the fall color trends to add an ombré that reflects the season. Take your auburn hair to the next level by adding pumpkin spice to the ends. If you’re a cool icy blonde, consider adding some icy blond to the tips. 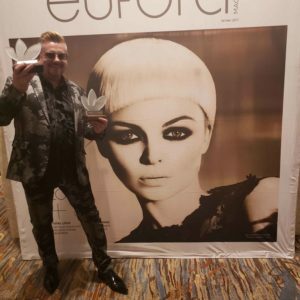 Whatever your style, make sure you find a professional stylist with a stellar reputation that you can trust. Great colorists can make almost anything possible, but they’ll also be honest with you about your hair’s limitations. A talented, trustworthy colorist makes all the difference to getting the fall hair color of your dreams!